The next national audition – 1st round of Competition – will take place in the Saint-Petersburg Music House on April 7, 2017. Competizione dell' Opera is the only one international singing competition which repertoire includes all nuances of the rich Italian opera: from the exquisite melodies of early music to the stylistic experiments of the 20th century. The competition traces its history back to 1996. Director of the competition is Hans-Joachim Fry. 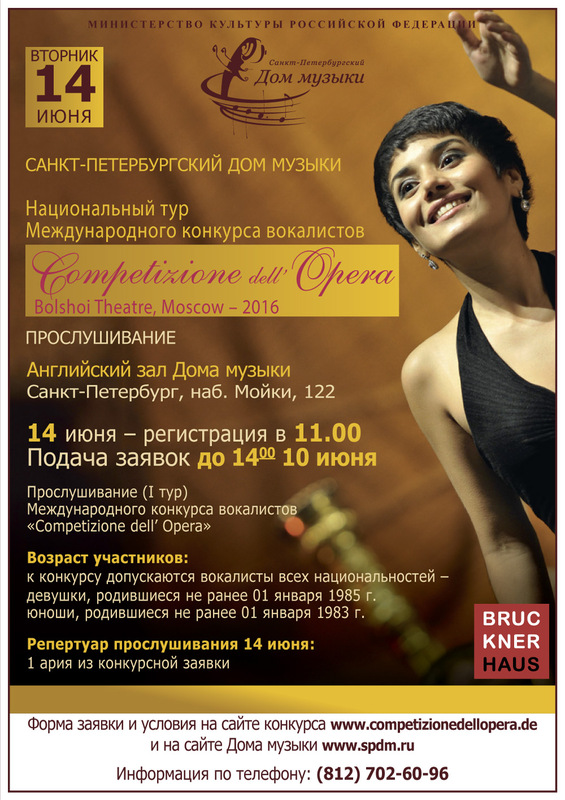 The Saint-Petersburg Music House is a traditional partner of the competition and arranges the 1st round for the Russian participants as well as concerts of the competition finalists. During the audition, all participants sing one of the opera arias indicated in their application forms as they desire. Additionally, the jury can request to sing another aria of the arias listed in the application form. Upon audition completion, the participants selected for the semi-finals are announced. For the competition, the participants should prepare six arias in Italian in the original key. 2. Two any arias from the opera repertoire in Italian. Arias should be selected from different operas. · If you invite the accompanist, you should notify the Music House of this to put the accompanist name in the access lists and inform the accompanist of the requirements of the hall. · Any expenses of the soloists related to audition will not be compensated. · On the day preceding, you should contact the Music House by phone to check whether your name is in the lists. · You should come from 10.30 am till 11 am for registration, then warm up in repetition room. Each participant is given no more than 5 minutes for voice trial in the hall. · The soloists and their accompanists shall have second pair of shoes without heels, spike heels, or metal taps. · Outdoor clothes shall be left in the storage room or cloakroom. · Be sure to carry your printed music for performances and concert dress. · The public are not admitted. The results will be published at the Music House web-site.